Although a slight divergence, it is important to understand a bit of history about the C language. C is the common languge of the systems programming world. Every operating system and its associated system libraries in common use is written in C, and every system provides a C compiler. To stop the language diverging across each of these systems where each would be sure to make numerous incompatible changes, a strict standard has been written for the language. Officially this standard is known as ISO/IEC 9899:1999(E), but is more commonly referred to by its shortened name C99. The standard is maintained by the International Standards Organisation (ISO) and the full standard is available for purchase online. Older standards versions such as C89 (the predecessor to C99 released in 1989) and ANSI C are no longer in common usage and are encompassed within the latest standard. The standard documentation is very technical, and details most every part of the language. For example it explains the syntax (in Backus Naur form), standard #define values and how operations should behave. It is also important to note what the C standards does not define. Most importantly the standard needs to be appropriate for every architecture, both present and future. Consequently it takes care not to define areas that are architecture dependent. The "glue" between the C standard and the underlying architecture is the Application Binary Interface (or ABI) which we discuss below. In several places the standard will mention that a particular operation or construct has an unspecified or implementation dependent result. Obviously the programmer can not depend on these outcomes if they are to write portable code. The GNU C Compiler, more commonly referred to as gcc, almost completely implements the C99 standard. However it also implements a range of extensions to the standard which programmers will often use to gain extra functionality, at the expense of portability to another compiler. These extensions are usually related to very low level code and are much more common in the system programming field; the most common extension being used in this area being inline assembly code. Programmers should read the gcc documentation and understand when they may be using features that diverge from the standard. gcc can be directed to adhere strictly to the standard (the -std=c99 flag for example) and warn or create an error when certain things are done that are not in the standard. This is obviously appropriate if you need to ensure that you can move your code easily to another compiler. As programmers, we are familiar with using variables to represent an area of memory to hold a value. In a typed language, such as C, every variable must be declared with a type. The type tells the compiler about what we expect to store in a variable; the compiler can then both allocate sufficient space for this usage and check that the programmer does not violate the rules of the type. In the example below, we see an example of the space allocated for some common types of variables. The C99 standard purposely only mentions the smallest possible size of each of the types defined for C. This is because across different processor architectures and operating systems the best size for types can be wildly different. To be completely safe programmers need to never assume the size of any of their variables, however a functioning system obviously needs agreements on what sizes types are going to be used in the system. Each architecture and operating system conforms to an Application Binary Interface or ABI. The ABI for a system fills in the details between the C standard and the requirements of the underlying hardware and operating system. An ABI is written for a specific processor and operating system combination. Above we can see the only divergence from the standard is that int is commonly a 32 bit quantity, which is twice the strict minimum 16 bit size that the C99 requires. Pointers are really just an address (i.e. their value is an address and thus "points" somewhere else in memory) therefore a pointer needs to be sufficient in size to be able to address any memory in the system. One area that causes confusion is the introduction of 64 bit computing. 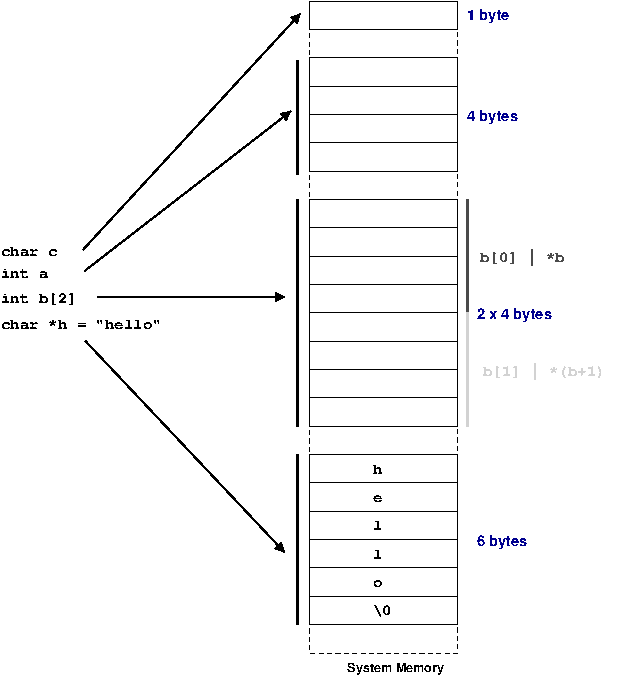 This means that the processor can handle addresses 64 bits in length (specifically the registers are 64 bits wide; a topic we discuss in Chapter 3, Computer Architecture). This firstly means that all pointers are required to be a 64 bits wide so they can represent any possible address in the system. However, system implementers must then make decisions about the size of the other types. Two common models are widely used, as shown below. You can see that in the LP64 (long-pointer 64) model long values are defined to be 64 bits wide. This is different to the 32 bit model we showed previously. The LP64 model is widely used on UNIX systems. In the other model, long remains a 32 bit value. This maintains maximum compatibility with 32 code. This model is in use with 64 bit Windows. There are good reasons why the size of int was not increased to 64 bits in either model. Consider that if the size of int is increased to 64 bits you leave programmers no way to obtain a 32 bit variable. The only possibly is redefining shorts to be a larger 32 bit type. A 64 bit variable is so large that it is not generally required to represent many variables. For example, loops very rarely repeat more times than would fit in a 32 bit variable (4294967296 times!). Images usually are usually represented with 8 bits for each of a red, green and blue value and an extra 8 bits for extra (alpha channel) information; a total of 32 bits. Consequently for many cases, using a 64 bit variable will be wasting at least the top 32 bits (if not more). Not only this, but the size of an integer array has now doubled too. This means programs take up more system memory (and thus more cache; discussed in detail in Chapter 3, Computer Architecture) for no real improvement. For the same reason Windows elected to keep their long values as 32 bits; since much of the Windows API was originally written to use long variables on a 32 bit system and hence does not require the extra bits this saves considerable wasted space in the system without having to re-write all the API. If we consider the proposed alternative where short was redefined to be a 32 bit variable; programmers working on a 64 bit system could use it for variables they know are bounded to smaller values. However, when moving back to a 32 bit system their same short variable would now be only 16 bits long, a value which is much more realistically overflowed (65536). By making a programmer request larger variables when they know they will be needed strikes a balance with respect to portability concerns and wasting space in binaries. The C standard also talks about some qualifiers for variable types. For example const means that a variable will never be modified from its original value and volatile suggests to the compiler that this value might change outside program execution flow so the compiler must be careful not to re-order access to it in any way. signed and unsigned are probably the two most important qualifiers; and they say if a variable can take on a negative value or not. We examine this in more detail below. Qualifiers are all intended to pass extra information about how the variable will be used to the compiler. This means two things; the compiler can check if you are violating your own rules (e.g. writing to a const value) and it can make optimisations based upon the extra knowledge (examined in later chapters). C99 realises that all these rules, sizes and portability concerns can become very confusing very quickly. To help, it provides a series of special types which can specify the exact properties of a variable. These are defined in <stdint.h> and have the form qtypes_t where q is a qualifier, type is the base type, s is the width in bits and _t is an extension so you know you are using the C99 defined types. It is up to the system implementing the C99 standard to provide these types for you by mapping them to appropriate sized types on the target system; on Linux these headers are provided by the system libraries. Below in Example 2.2, “Example of warnings when types are not matched” we see an example of how types place restrictions on what operations are valid for a variable, and how the compiler can use this information to warn when variables are used in an incorrect fashion. In this code, we firstly assign an integer value into a char variable. Since the char variable is smaller, we loose the correct value of the integer. Further down, we attempt to assign a pointer to a char to memory we designated as an integer. This operation can be done; but it is not safe. The first example is run on a 32-bit Pentium machine, and the correct value is returned. However, as shown in the second example, on a 64-bit Itanium machine a pointer is 64 bits (8 bytes) long, but an integer is only 4 bytes long. Clearly, 8 bytes can not fit into 4! We can attempt to "fool" the compiler by casting the value before assigning it; note that in this case we have shot ourselves in the foot by doing this cast and ignoring the compiler warning since the smaller variable can not hold all the information from the pointer and we end up with an invalid address. With our modern base 10 numeral system we indicate a negative number by placing a minus (-) sign in front of it. When using binary we need to use a different system to indicate negative numbers. There is only one scheme in common use on modern hardware, but C99 defines three acceptable methods for negative value representation. The most straight forward method is to simply say that one bit of the number indicates either a negative or positive value depending on it being set or not. This is analogous to mathematical approach of having a + and -. This is fairly logical, and some of the original computers did represent negative numbers in this way. But using binary numbers opens up some other possibilities which make the life of hardware designers easier. However, notice that the value 0 now has two equivalent values; one with the sign bit set and one without. Sometimes these values are referred to as +0 and -0 respectively. Again we still have the problem with two zeros being represented. Again no modern computer uses one's complement, mostly because there is a better scheme. Two's complement is just like one's complement, except the negative representation has one added to it and we discard any left over carry bit. So to continue with the example from before, -90 would be ~01011010+1=10100101+1 = 10100110. This means there is a slightly odd symmetry in the numbers that can be represented; for example with an 8 bit integer we have 2^8 = 256 possible values; with our sign bit representation we could represent -127 thru 127 but with two's complement we can represent -127 thru 128. This is because we have removed the problem of having two zeros; consider that "negative zero" is (~00000000 +1)=(11111111+1)=00000000 (note discarded carry bit). You can see that by implementing two's complement hardware designers need only provide logic for addition circuits; subtraction can be done by two's complement negating the value to be subtracted and then adding the new value. Similarly you could implement multiplication with repeated addition and division with repeated subtraction. Consequently two's complement can reduce all simple mathematical operations down to addition! All modern computers use two's complement representation. Because of two's complement format, when increasing the size of signed value, it is important that the additional bits be sign-extended; that is, copied from the top-bit of the existing value. For example, the value of an 32-bit int -10 would be represented in two's complement binary as 11111111111111111111111111110110. If one were to cast this to a 64-bit long long int, we would need to ensure that the additional 32-bits were set to 1 to maintain the same sign as the original. Thanks to two's complement, it is sufficient to take the top bit of the exiting value and replace all the added bits with this value. This processes is referred to as sign-extension and is usually handled by the compiler in situations as defined by the language standard, with the processor generally providing special instructions to take a value and sign-extended it to some larger value. So far we have only discussed integer or whole numbers; the class of numbers that can represent decimal values is called floating point. To create a decimal number, we require some way to represent the concept of the decimal place in binary. The most common scheme for this is known as the IEEE-754 floating point standard because the standard is published by the Institute of Electric and Electronics Engineers. The scheme is conceptually quite simple and is somewhat analogous to "scientific notation". In scientific notation the value 123.45 might commonly be represented as 1.2345x102. We call 1.2345 the mantissa or significand, 10 is the radix and 2 is the exponent. In the IEEE floating point model, we break up the available bits to represent the sign, mantissa and exponent of a decimal number. A decimal number is represented by sign × significand × 2^exponent. The sign bit equates to either 1 or -1. Since we are working in binary, we always have the implied radix of 2. There are differing widths for a floating point value -- we examine below at only a 32 bit value. More bits allows greater precision. The other important factor is bias of the exponent. The exponent needs to be able to represent both positive and negative values, thus an implied value of 127 is subtracted from the exponent. For example, an exponent of 0 has an exponent field of 127, 128 would represent 1 and 126 would represent -1. Each additional digit allows a greater range of decimal values we can represent. In base 10, each digit after the decimal place increases the precision of our number by 10 times. For example, we can represent 0.0 through 0.9 (10 values) with one digit of decimal place, 0.00 through 0.99 (100 values) with two digits, and so on. In binary, rather than each additional digit giving us 10 times the precision, we only get two times the precision, as illustrated in the table below. This means that our binary representation does not always map in a straight-forward manner to a decimal representation. With only one bit of precision, our fractional precision is not very big; we can only say that the fraction is either 0 or 0.5. If we add another bit of precision, we can now say that the decimal value is one of either 0,0.25,0.5,0.75. With another bit of precision we can now represent the values 0,0.125,0.25,0.375,0.5,0.625,0.75,0.875. Increasing the number of bits therefore allows us greater and greater precision. However, since the range of possible numbers is infinite we will never have enough bits to represent any possible value. A practical example is illustrated above. Notice that for the default 6 decimal places of precision given by printf both answers are the same, since they are rounded up correctly. However, when asked to give the results to a larger precision, in this case 20 decimal places, we can see the results start to diverge. The code using doubles has a more accurate result, but it is still not exactly correct. We can also see that programmers not explicitly dealing with float values still have problems with precision of variables! In scientific notation, we can represent a value in many different ways. For example, 10023x10^0 = 1002.3x101 = 100.23x102. We thus define the normalised version as the one where 1/radix <= significand < 1. In binary this ensures that the leftmost bit of the significand is always one. Knowing this, we can gain an extra bit of precision by having the standard say that the leftmost bit being one is implied. As you can see above, we can make the value normalised by moving the bits upwards as long as we compensate by increasing the exponent. A common problem programmers face is finding the first set bit in a bitfield. Consider the bitfield 0100; from the right the first set bit would be bit 2 (starting from zero, as is conventional). The standard way to find this value is to shift right, check if the uppermost bit is a 1 and either terminate or repeat. This is a slow process; if the bitfield is 64 bits long and only the very last bit is set, you must go through all the preceding 63 bits! However, if this bitfield value were the signficand of a floating point number and we were to normalise it, the value of the exponent would tell us how many times it was shifted. The process of normalising a number is generally built into the floating point hardware unit on the processor, so operates very fast; usually much faster than the repeated shift and check operations. The example program below illustrates two methods of finding the first set bit on an Itanium processor. The Itanium, like most server processors, has support for an 80-bit extended floating point type, with a 64-bit significand. This means a unsigned long neatly fits into the significand of a long double. When the value is loaded it is normalised, and and thus by reading the exponent value (minus the 16 bit bias) we can see how far it was shifted. In the example code below we extract the components of a floating point number and print out the value it represents. This will only work for a 32 bit floating point value in the IEEE format; however this is common for most architectures with the float type. Sample output of the value 8.45, which we previously examined, is shown below. From this example, we get some idea of how the inaccuracies creep into our floating point numbers. Note that C99 also has portability helpers for printf. The PRI macros in <inttypes.h> can be used as specifiers for types of specified sizes. Again see the standard or pull apart the headers for full information. The ~ operator is the C language operator to apply NOT to the value. It is also occasionally called the one's complement operator, for obvious reasons now!